The Boomkroonpad outdoor centre is the starting point for a number of cycling and walking routes through extensive woodland. If you would like to see the woods from a different perspective, you can take an aerial walk along the Tree Top Path near the Ranger Kuhn House in Papenvoort. The walk begins in a tunnel through the tree roots and then quickly climbs to 7.5 metres. At its highest you are walking at an altitude of 22.5 metres through the tops of the trees with a fantastic view over woodland spread over a very wide area. In the 1950’s and 1960’s most of the deciduous trees in the woods around the Boomkroonpad were felled. The faster growing conifers could produce more wood and hardwood got in the way of the heavy machines. At the same time there was a demand for more varied woodland with a greater variety of species, more variation between old and young wood and also for dead wood which could be used for ground feeding by many woodland birds and animals. Who will find the wise Hoteme Totem? 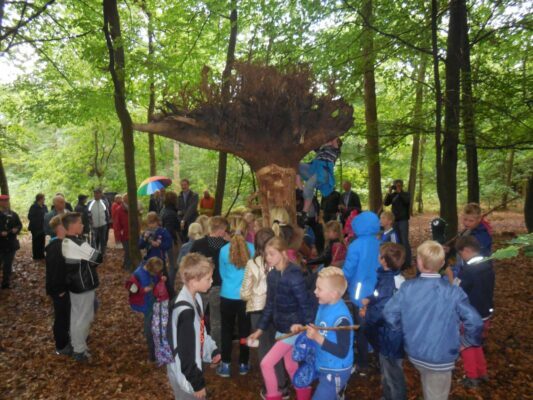 Following the Green Feather experience path children can learn everything about the woods. This is a 3 kilometre path, marked with small totems. Children can make a rucksack in advance which they can fill with beautiful leaves and other things they find in the woods. They can also make woodland symbols, search for animal tracks, make natural artwork and do lots of other exciting things. Eventually they will find the Wise Hoteme Totem in the woods. 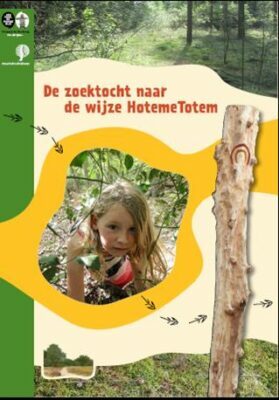 Children wishing to go in search of the Wise Hoteme Totem and walk the experience path can buy a special Green Feather package for 5 euro at the Boomkroonpad outdoor centre.